The Bunnicula TV series premieres Saturday, February 6, 2016, at 9:30am ET/PT on Cartoon Network. Boomerang will air an encore presentation at 6:30pm ET/PT. 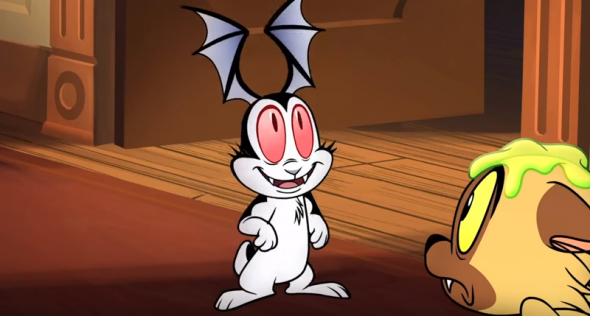 Watch a clip from the Bunnicula series premiere episode, “Mumkey Business,” below. Bunnicula is joining Cartoon Network’s Saturday morning line-up, which also includes The Tom and Jerry Show; Wabbit; and Be Cool, Scooby Doo! Bunnicula was developed by Wabbit‘s Jessica Borutski. The Grim Adventures of Billy and Mandy‘s creator, Maxwell Atoms (a.k.a. Adam Burton), is also attached to the project. Based on the Bunnicula children’s book series by James Howe, the Bunnicula TV show features a vampire bunny who drains the juice out of veggies and gets up to supernatural hi-jinx, much to the consternation of Chester the cautious cat. “BUNNICULA,” A NEW SERIES FROM WARNER BROS. ANIMATION, PREMIERES THIS SATURDAY ON CARTOON NETWORK! Tune in to Cartoon Network this Saturday for a morning full of fun for the whole family! Joining the lineup of favorites such as The Tom and Jerry Show, Wabbit and Be Cool, Scooby-Doo! will be the all-new highly-anticipated series Bunnicula, based on the acclaimed children’s books and produced by Warner Bros. Animation. “Mumkey Business” – After Chester has had enough of Bunnicula’s supernatural hijinx, he decides to lock the rabbit back in the cellar crypt he came from. But when he takes Mina’s key, he unknowingly releases a second dangerous force into the apartments, in the form of a mummified monkey! “Walking Fish” – When a magical harmonica atracts [sic] zombie fish to the Orlock apartments, Bunnicula must find a way to keep them from scaring Mina. Did you read the Bunnicula books? Are you looking forward to the Bunnicula TV show? Do you plan to check out the Bunnicula TV series premiere this Saturday, on Cartoon Network? Tell us. More about: Bunnicula, Bunnicula: canceled or renewed?, Cartoon Network TV shows: canceled or renewed? I have only seen one episode but I have a feeling, it’s only going to get better. It’s beautiful to watch, the characters are funny and heartfelt, most of all, Chris Kattan is brilliant as the voice of ‘Bunnicula.’ I hope it stays on for decades. Incredible job to the entire team and bravo to Warner Bros! This is what happens when you use your brains!!! Hope Howie is in the new series.